Perfume There are 7 products. Mini travel perfume bottle. With atomizer. Volume: 5ml. Color sent randomly. Transparent bottle and silver spray. Capacity: 50 ml. Material: glass. Use for perfume, liquid, etc. Capacity: 2ml / pcs. Size: 4.5*1.5cm. Color will be sent randomly. 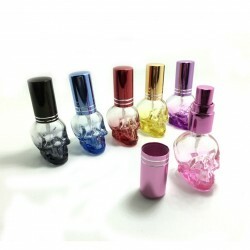 3D Skullcandy Perfume Bottle Atomizer. Material: glass. Size: 4.1cm. Capacity: 8ml. Please select a color. Heart Design, Perfume Bottle Container. Simple to refill. Material: plastic, glass. Capacity: 25ml. Color: shipped random.